Visual.ly has published this really useful and free e-book on Micro Content. As our attention fragments and more and more of us are reading content on mobile devices, content creators are finding that the best way to engage audiences is with shorter, bite-sized chunks of content known as “Micro Content.” The e-book, which at 32 pages, is definitely long-form content provides context, best practices, examples, tools, and resources. I don’t know about you, but as a content consumer, I still do consumer long-form content to get a better understanding of a topic. As a content creator, one thing to keep in mind, that if you can create long-form by aggregating micro content or take the Lizzy Borden approach and chop up an existing long form content piece – either way if you create in this modular way you have both forms to publish. What is micro content anyway? Yes, it is the opposite of longform content – reports, books, slidedecks, articles – and even blog posts. Micro-content is optimized for social media channels and sharing. There many forms of micro-content: tweets, Facebook status updates, curated links, Vine videos, photos, visual quotes, etc. The e-book gives an entertaining historical perspective on micro-content which is not just a product of a networked age. 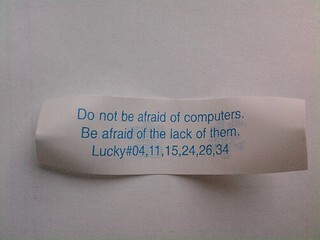 For example, gum wrappers and fortune cookies are micro content. The e-book also points out that headlines may be the most basic type of micro-content, and have been a part of print publications for decades – think newspaper headlines. Headlines are really tweets and more recently good headline writing is an essential skill for nonprofit marketers who embrace social a la “the Upworthy headline.” The e-book covers examples of micro-content on different social media platforms and channels, pretty much the usual suspects. However, here’s one to think about data visualizations. Not just infographics, but a snippet from an infographic or a chart or graph to illustrate a statistic. Small visualizations of data or illustrations of ideas are effective visual micro content, especially when they are fun and easily digestible piece of content. With so many media options available, from TVs and laptops to smartphones and tablets, consumers are often engaging with multiple platforms at the same time. Research firm Millward Brown’s recent AdReaction study found that more than 40% of 16- to 45-year-old multiscreen consumers in the United States use devices simultaneously. You can hone in on this audience by crafting stackable content that meshes well with other platforms and encourages sharing. The e-book has a good list of micro-content creation tools, many free or low cost for your tool box and for your mobile phone. Here’s two new ones that I discovered and have added to my tool box. Cogggle Sometimes, you may be dealing with a difficult subject that can be daunting to your audience. A great way of inviting your readers to dive into your post is to create a mind map. This visual can help guide your reader through complex ideas that otherwise might have gotten lost in translation. Coggle is a free, straightforward mind mapping tool that allows you to work independently or invite others to work on the map as well, after signing in with Google. Just double-click on the main Coggle to get started and the rest is cake. You can download the e-book here.